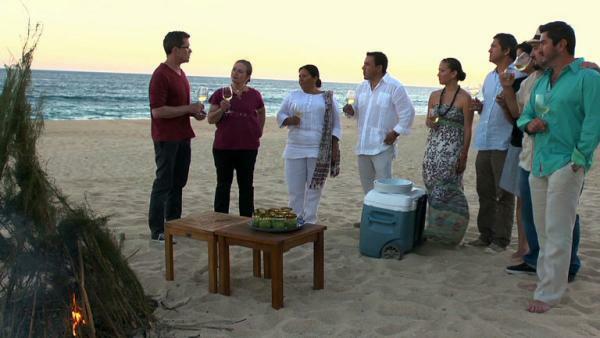 Rick introduces the viewers to some of Los Cabos top chefs and their restaurants then cooks dinner for them at a luxurious beach house. Rick makes a tamarind chile sauce to go with his fish and eggplant course. Margarita Carrillo, chef and owner of Don Emiliano Restaurant in San Jose del Cabo makes her special tomatillo tart for dessert. Together they cook chocolate clams on the beach with their guests. At dinner, Rick, Margarita and the local chefs discuss the philosophy of cooking for people and the meaning of dining together. Rick introduces the viewers to some of Los Cabos top chefs and their restaurants, including Margarita Carrillo, chef and owner of Don Emiliano Restaurant in San Jose del Cabo. This recipe was adapted from the recipe that Chef Margarita sent us. Although she used pearl tapioca in her recipe, we found that tapioca flour was easier to use. This main dish highlights Cabos' fresh seafood and uses freshly-toasted ancho chiles. At dinner, Rick, Margarita and the local chefs discuss the philosophy of cooking for people and the meaning of dining together.